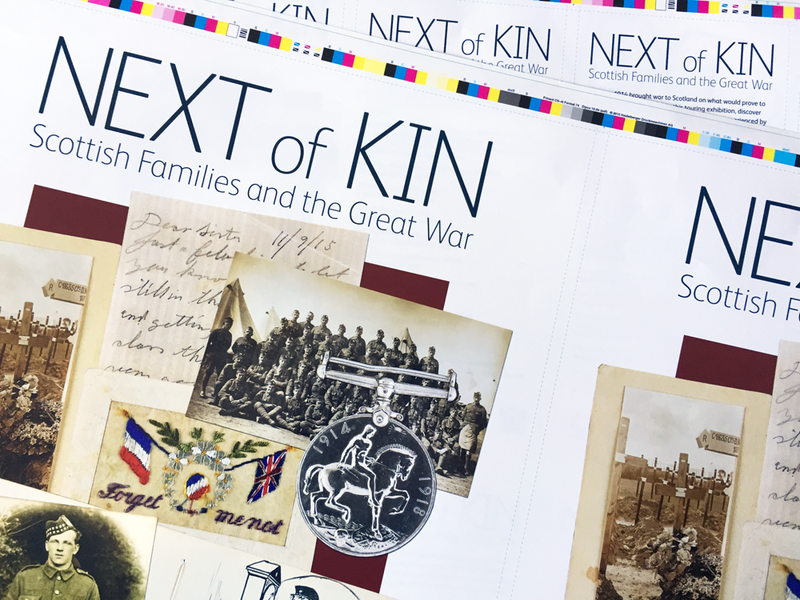 I have been working on Next of Kin, a National Museums Scotland touring exhibition, which reveals the personal stories of separation and loss experienced by Scottish families and communities with loved ones fighting on the fronts, and features keepsakes such as letters and postcards, medals sent to next of kin, and unique artefacts collected by troops as souvenirs. 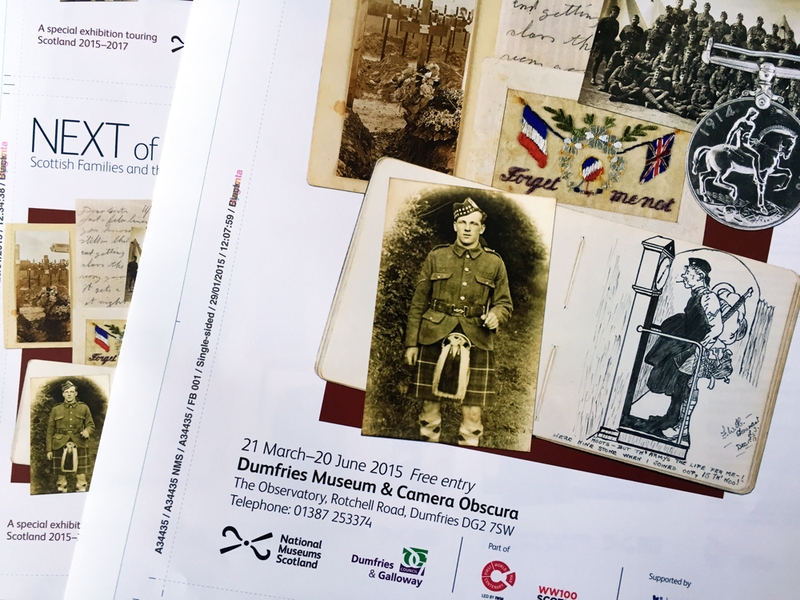 I worked with a selection of images of objects from the exhibition to create a layered montage, with subtle drop shadows, which suggests that the objects - which are mainly two dimensional - are placed in a pile on a table, or pinned to noticeboard. I arranged the objects to develop a narrative, with an implied relationship between the photographs, letters, medals and keepsakes. I created other iterations of the montage using processes that took the images away from their 'natural' colours, making them black and white or bitmapped, with overlaid transparent colours to add texture and visual interest, and to carry connotations of stacks of photocopied material in an archive. An earlier iteration had used a square grid to frame the objects to establish the themes of the exhibition in a more formal manner. However, the version shown here is the Museum's preferred treatment. 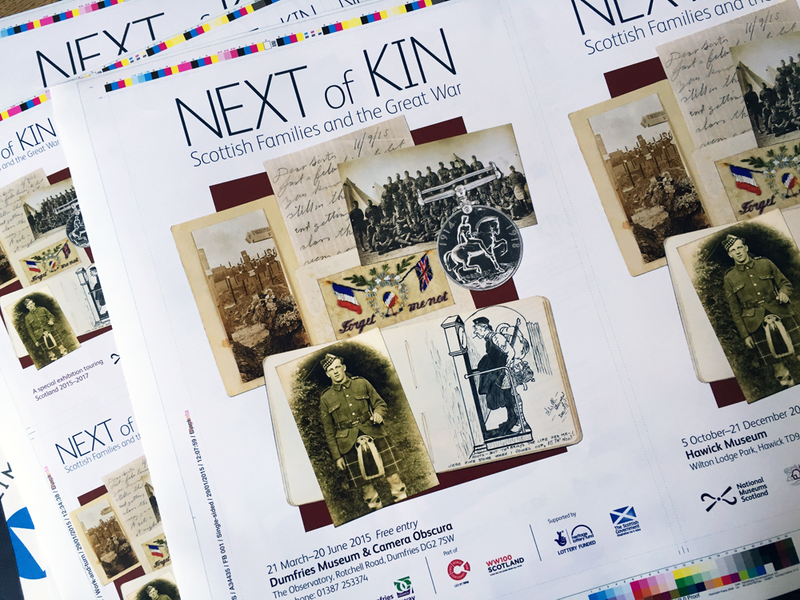 The marketing material is being printed by Allander, in Edinburgh, on a selection of different weights of Vision Superior. I'm looking forward to seeing the results!